It's still summer for a couple more days, right? Crap crap crap I still have summer collections to post before it ends! Here's one of Borghese's summer offerings, gelato themed! I love pistachio gelato... mmm. Berry Confezione. A really punchy bright fuchsia/light purple creme. Not a neon, but still very clear and bright. Limoncello. Oh man, I love limoncello... the liqueur, not so much the polish. Okay, Limoncello the polish is not so bad, it's just a little sheer and doesn't mesh quite so well with my skintone. It's a pale yellow frost. I think this was four or five coats, I don't remember for sure, but it was definitely on the sheer side. Maraschino. My favorite of the collection. A really bright coral-red creme. Looks better in real life than it does in my picture. The color is so bright and colorful that it did that weird thing to my camera that neons do. Not a neon, but still really bright. Menta. This is one of the ones I bought before I knew it was part of a collection. Looks better in the bottle than it does on the nail, sadly. Absolutely nothing wrong with the color, it's a gorgeous sparkling turquoise shimmer. My issue with it is the sheerness- it's extremely sheer. This is five coats and you can still see my nails through it. Pistaccio. Another one I bought randomly off the shelf at Ulta. 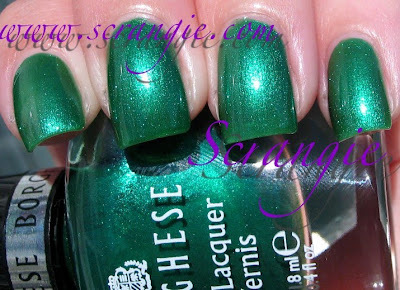 A green shimmer! Had to have it. Sadly, like Menta, it's ridiculously sheer. This is five coats. The color is great, it's a rich green shimmer, but I don't have the patience to do five coats unless the color is really, really unique. Tutti Gelati. A pink with silvery shimmer. Almost glass-fleck like shimmer. Could be a warmer cousin to China Glaze's 100 Proof Pink. I'm pretty new to Borghese polish. I'm really liking a couple of the shades and now I want to try more. Before these my collection was Espresso Brown, some minis with glitter, Stellare Notte (which is AMAZING), a pink shimmer from the clearance bin at TJ Maxx and Almondine. Very curious to see what they release next... Hopefully another sweet duochrome like Stellare Notte! Is the berry color a dupe for OPI ate berries in the canaries from the espana collection or dim sum plum from the hong kong collection. Also, is Tutti Gelati a dupe for flower to flower from the summer flutter collection from opi also. I got Pistachio, Mentha, Maraschino, and Limoncello free with my drugstore points this summer. I may have better bottles of Mentha and Limoncelo - they were both fairly opaque in 3 coats. Pistachio was a bit thinner. I only own a mini collection. I haven't tried them yet. These are pretty but nothing that special for me to buy. Maraschino is very pretty! WOW! That Berry Confezione is killer! ooh those pinks are good! I love Berry Confezione!